Floor plan is a point and click puzzler that is a little more complex than it initially appears. At it’s core this is an escape room type game with the difference being that the rooms around you change, making this feel unique in the ever growing escape genre. Patience may be the key, but if you get stuck this game offers some help to keep you moving. 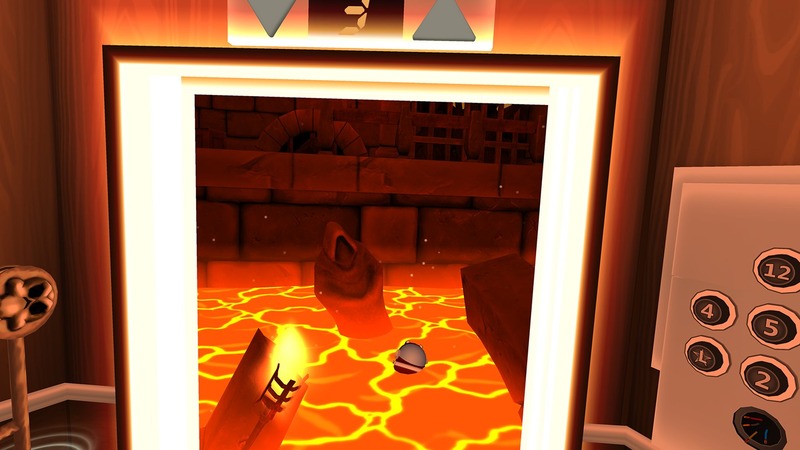 That little helmet floating in the lava, that is your white whale…it will consume you!!! Only requiring the one button, controls are handled by touching to touch pad, touch controller or game pad button to interact with objects or characters in a room. Changing rooms? Same deal just tap on your headset too navigate up and down in this odd apartment. You can hold up to 4 items at a time and you will need all these items to get what you need to dress a mannequin in a space suit…it’s more fun than it sounds. Some light comedic moments are scattered throughout the game as well to add to your enjoyment. If you get stuck you can always call the building manager for help, who will give you clues necessary to solving your next objective. It all works really well and some puzzle do require some out of the box thinking to solve, but nothing that should stop you playing…there is always the help button if your stumped. As you travel from floor to floor, each level is a puzzle that more often than not will require an item from another room to solve, or may require another room’s puzzle to be solved, changing the environment in the next room. Initially, only a handful of rooms are available but as you solve the early puzzles, more room options open up. It can be a little confusing at times, but trial and error (and that help button) will get you through. 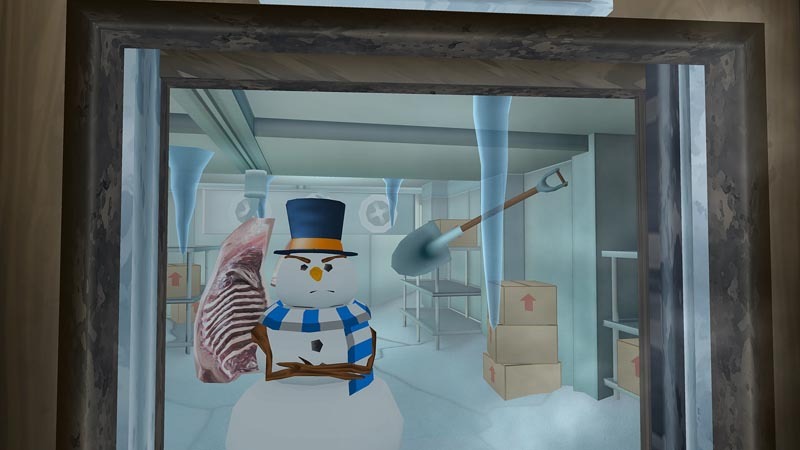 This game, like many Gear VR games, uses a cartoonish art style which looks good enough, though details are a little low, the overall presentation is delight to look at. Every room you visit has a different theme with some odd characters to greet you as well. Animations are smooth and very polished. The audio as well is simple with sound effects that fit what you are viewing along with some elevator music to keep you company. It’s not the most visually stunning game you have ever seen, but the character and polish behind the graphics makes this a pleasant jaunt in VR. Audio effects as well are solitary, but work all the same. Opening your elevator door often leads to a little animation with some corresponding audio that just works together nicely! Each room’s puzzle is unique from the last so be prepared to use your brain muscles! 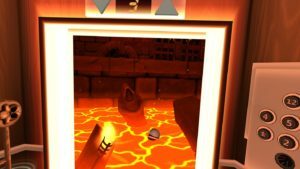 Floor plan is an excellent escape room game that has a few challenging moments and is a unique twist on the genre. With that said, I beat this game in 35 minutes (with a few help button presses) and while I did enjoy it, the short play time is a definite factor in your purchase and once you beat it, that’s it. There is no reason to replay it unless you want to see how fast you can crush it on your second try. If you like point and click puzzle games than I recommend Floor Plan just for it’s different look at the genre and polished gameplay. Even for full price you still get a top quality game, even if it is a bit short. What would I pay? $5 is fine! The game time may be a little on the short side but it has some nice polish and regardless of what you spend, you’ll have a good time while it lasts.